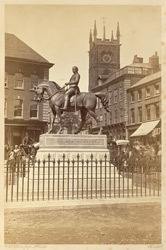 After the death of Prince Albert in 1861 the people of Wolverhampton and the mayor, George Lees Underhill, raised funds to erect a statue in his memory. Sculptor Thomas Thorneycroft finished the memorial in 1866 which Queen Victoria herself unveiled during a public ceremony attended by crowds from all over the Midlands. "The statue is in bronze, is about nine feet in height, or, with the pedestal, nearly sixteen feet. The Prince Consort is represented in the uniform of a Field Marshall, and the attitude chosen is that of returning the salutations of the people - the Prince at the moment, gently restraining his charger, which, with open mouth, appears to be champing and playing with his bit. It was a desire of Her Majesty that the Prince should be represented in military dress, although it was as a civilian that he was failiar to the view, as he was endeared to the hearts of the people. the Prince wears over the surtout the ribbon of the Order of the Garter, with the usual insignia; and the bold diagonal line thus presented from the shoulder ot the waist forms a prominent element in the flow of the dress."